I had a dog named Bubba.. Yesterday morning at 11:50 my beloved dog Bubba passed away in my arms. Bubba was battling bone cancer and yesterday we both gave up the fight. I want to think Bubba is pain free now and off running somewhere chasing cats (his favorite past time, though what he would have done with one had he caught it remains a mystery). I was very attached to Bubba more so than any other pet I have had. I want to cry and cry because of my attachment but am holding back. See, I want to think these things, and work through the pain but I have a problem. I am Buddhist and as a Buddhist I don’t believe in heaven nor should I be so attached to my pain that it overwhelms me. Some Buddhist I have turned out to be! I never meant to become attached to my dog. He started out as a playmate/protector for my then 8 year old son. We found Bubba (already named) in a local pound. 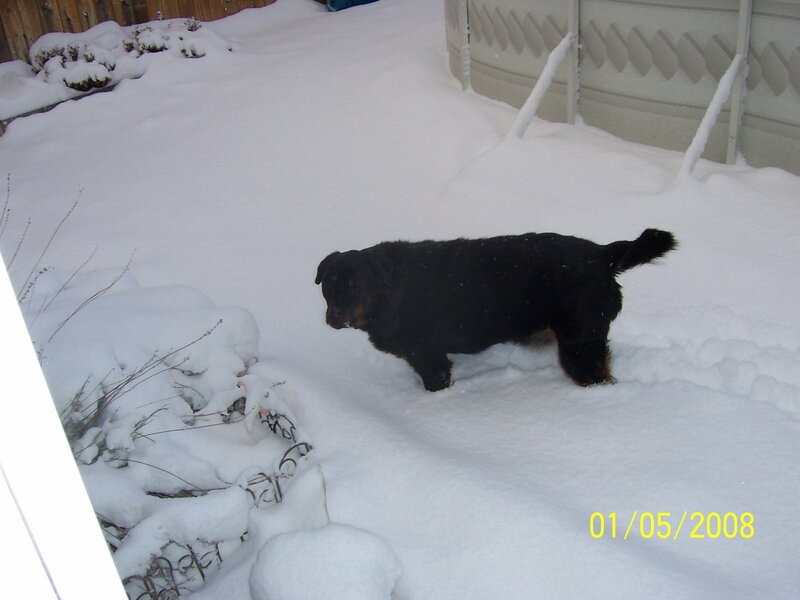 He was a Rottweiler mix, and it was love at first site for all of us. We took him home and soon he and my son were inseparable. Bubba crossed that invisible line with me; the line that said he is an animal not my other kid, don’t become attached. At the time of my divorce it was clear I was becoming a single mother of two. Bubba and my son Alex were constantly on my mind. Where is a good place for them to live? Will they adjust to their new surroundings? Will they be happy? All my major decisions revolved around my two kids. Bubba was always happy and adjusted well. In fact Bubba survived two long distance moves, one short disastrous relationship (for me not him) and finally he survived my son growing up. It never occurred to me that Bubba would have to face a life threatening illness. I assumed one day, after many, many years he would pass on like my grandfather, peacefully and with a smile. Now I am facing the loss of a beloved companion and protector. I could be a good Buddhist and work on letting my feelings and thoughts go, but I won’t. I am going to honor my friend by embracing my feelings for him. I am going to cry for my loss and at the same time I am going to picture him chasing cats and being petted and loved by many souls. This is why I am writing tonight. I want everyone to know I had a dog named Bubba who was the best friend anyone could ask for. I am so sorry for your loss, Sari. Our animals work their way into our hearts and lives and become a part of our families. We are lucky to have them for the time that we are given. So sorry for your loss Sari. He really sounds like he was a very special friend. Our pets become part of the family and are so in tune with our thoughts and feelings. They know just the right thing to do to cheer us up or make us feel better. And they are more loyal than any people I know. That’s what makes them such a special part of our lives. I hope time will help to ease your pain. I’m glad you were able to share your life with such a special friend. Thank you Linda for your understanding and kind words. Bubba was the first four legged pet I can remember having that became more than a pet. The loss will stay with me for a long time, but I am also honoring his memory by thanking him for his time with us. If I could I am sure I would do it again.Thank you for taking the time to not only read my blog but respond. I have just started blogging. Someone suggested I do this as a way to practice my writing skills. It is nice to see someone read something I wrote LOL!